Moqueca baiana which translates to “Bahian stew” in Portugese is literally that — a delicious Brazilian seafood stew originating from the Bahia state in the Northeast region of the country. This dish is influenced by African cuisine, which is most noticeable in its use of palm oil. Palm oil is an edible vegetable oil made from the reddish pulp of African oil palm fruit. Palm oil, along with coconut oil, are very high saturated fats and both are typically used in African, Southeast Asian, and Brazilian cooking. 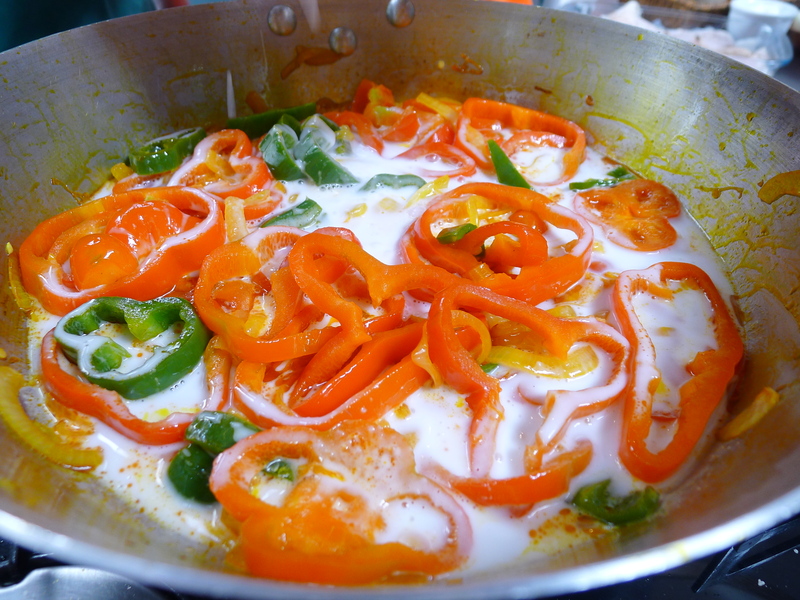 We made moqueca in during my Brazilian Cooking Class by first sauteing onions and peppers in palm oil, and then slow cooking the vegetables in coconut milk. 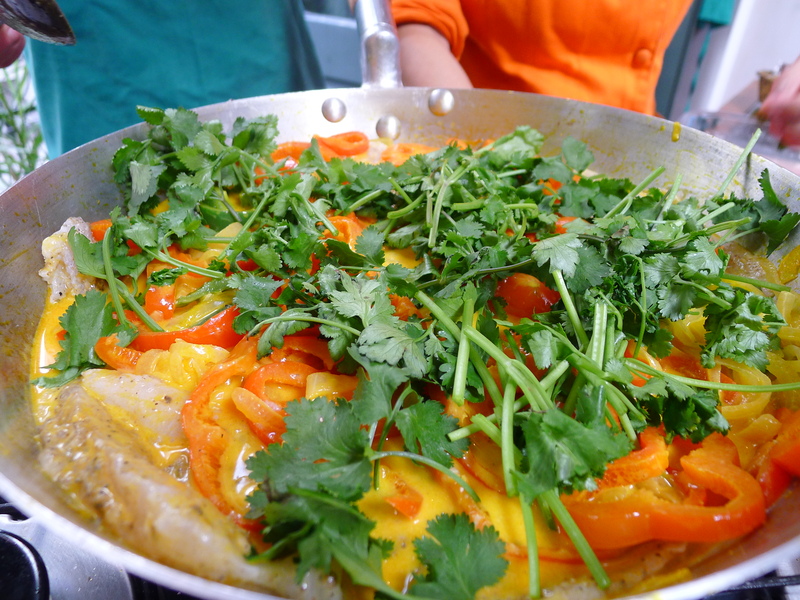 We then added marinated white fish (you can also add shrimp) and fresh cilantro. We served this with a sweet and savory Farofa de Banana and some nice strong caipirinhas for a lovely Brazilian meal. For stews, it is best to use fresh and firm white fish like halibut, swordfish, or cod. If you cannot find palm oil, olive oil will work as as substitute. 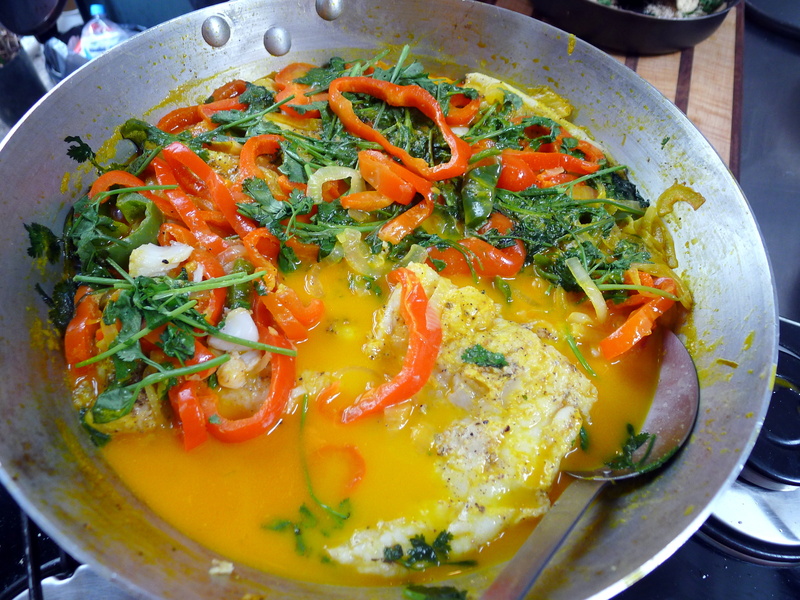 In fact, another version of moqueca which originates from the Southeast state of Espírito Santo is made with olive oil and no coconut milk. 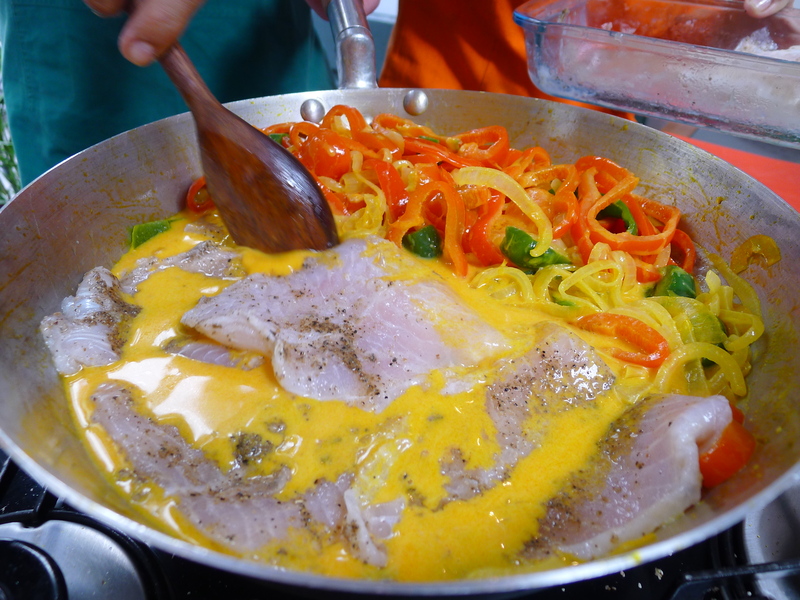 There, the dish is called moqueca capixaba. 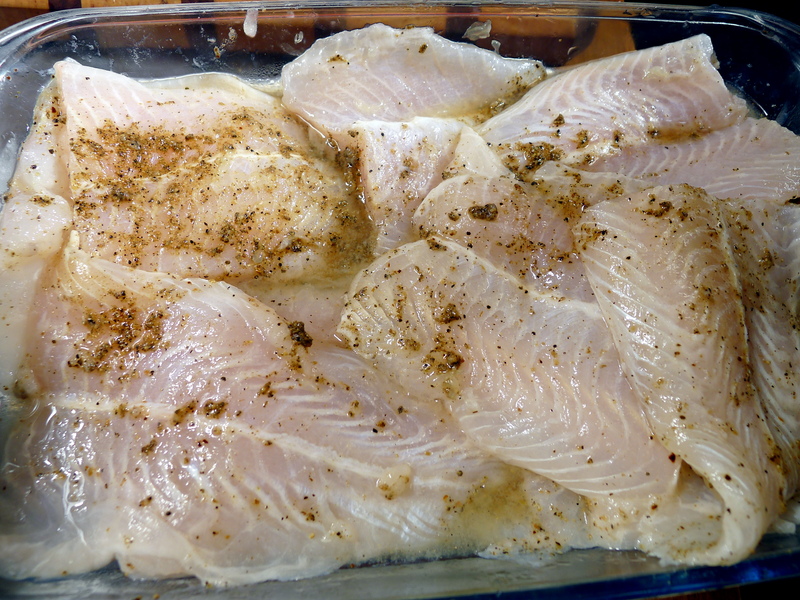 Marinate the fish with the salt, pepper, lime juice, and ground cumin. Allow to sit for 10 minutes. 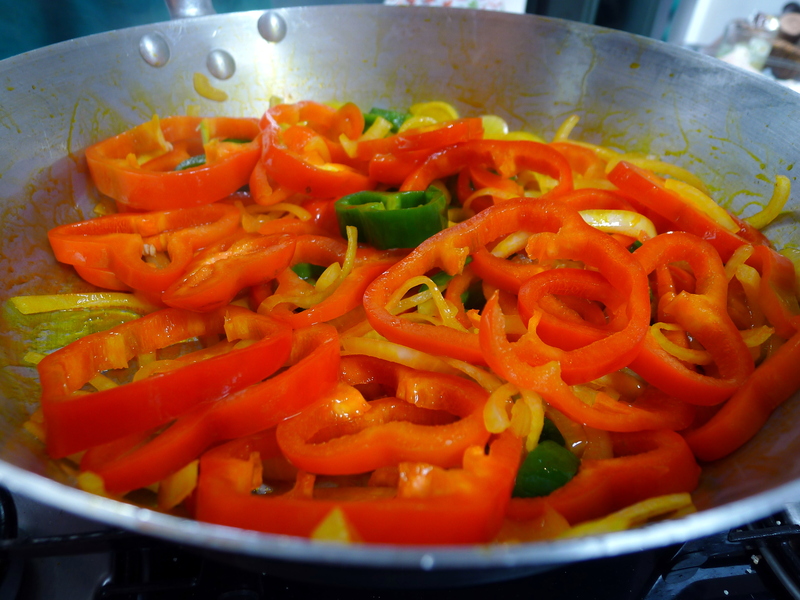 In a large wok, saute the onions and bell pepper rings with the palm oil. Stir fry for a couple minutes, until the vegetables lose their natural color. Add the coconut milk and bring to a boil, then gently simmer for 15 minutes. Keep the heat on low and add the fish. Gently stir and cook the fish until it is no longer translucent. Top with fresh cilantro and serve hot. Enjoy with Farofa of Banana and some freshly mixed caipirinhas !